A high-style mix of old and new keeps this Tudor’s charm intact, even after a major facelift. If the kitchen is the heart of the home, then ours was in need of a triple bypass. When we bought a house halfway across the country — without having set foot in it — we knew there would be projects. Walls to paint, old carpet to pull up, a dingy bathroom to tackle. And while the kitchen was certainly on the to-do list, we assumed we could live with the old appliances and chipped tile countertop for a time. After signing on the dotted line, I began exploring the house and discovered the many broken appliances that had been curiously omitted from the seller’s property disclosure form. “The dishwasher doesn’t work,” I told Roger over the phone. “We knew that, right?” he replied. “Well, that can all be fixed,” he assured me. 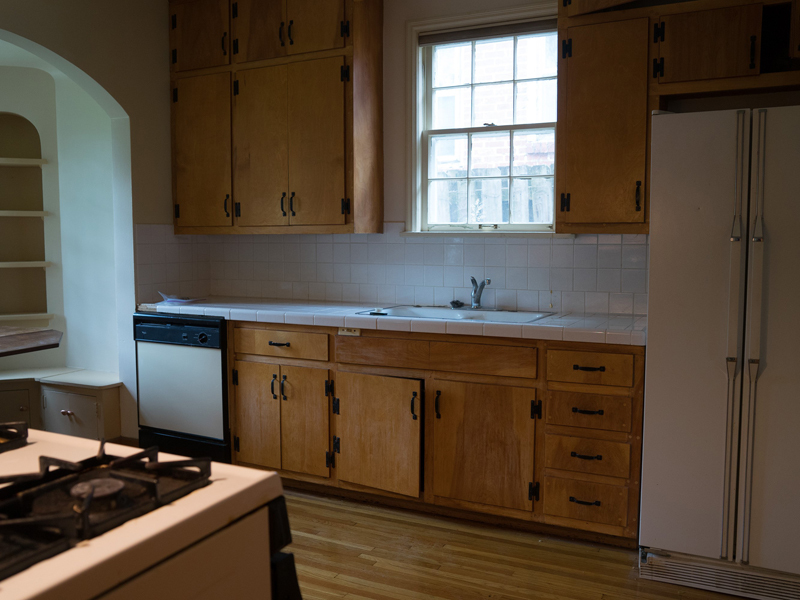 Before: With broken appliances and dingy cupboards, this dated kitchen was screaming for a facelift. The home’s last thorough cleaning had been sometime during the Bush administration (the first one). Aggressive dusting, vacuuming, and mopping improved the situation, but the suspect plumbing and appliances put up a fight. Consequently, we soon reprioritized the kitchen from a six-months-from-now project to an ASAP project. Roger and I have renovated dozens of kitchens for clients. 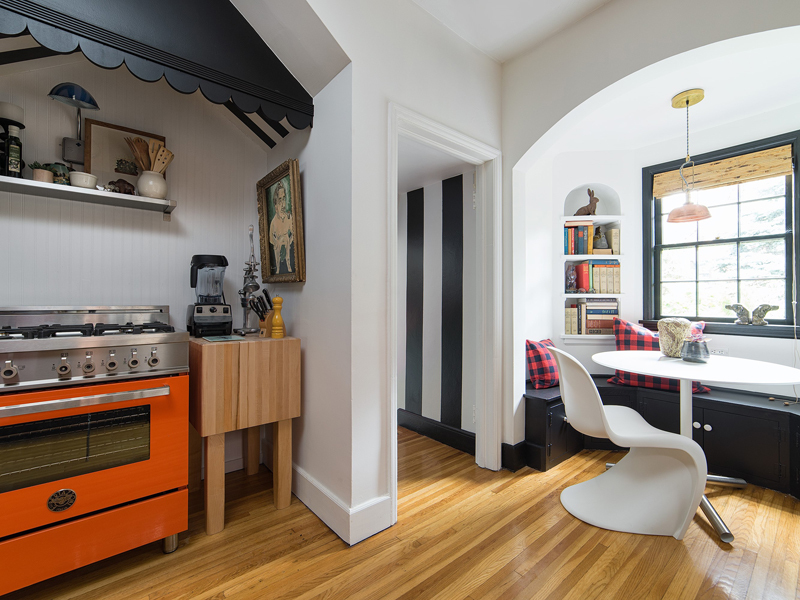 We’ve reconfigured, rearranged, and repurposed kitchens in homes around the country. We even designed a line of cabinetry. So, our biggest challenge in devising a plan for our charming Tudor wasn’t how to renovate, but how much to renovate. The relatively small space could only be configured so many ways, so pulling out the original cabinets would likely mean replacing them with new cabinets of similar configuration and capacity. While they needed a good cleaning, they were all structurally sound, and the finish on the upper cabinets was still good, so we opted to keep them. 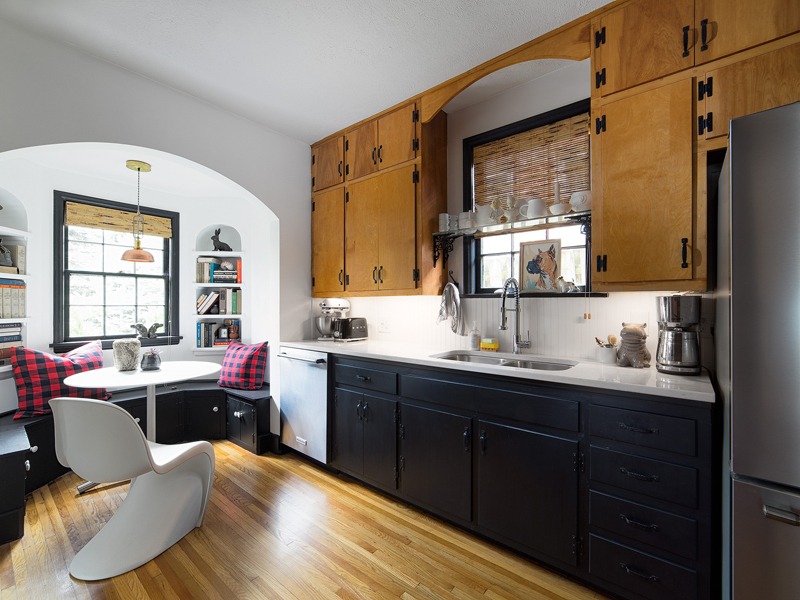 Other distinctive elements, like the convenient laundry chute and the breakfast nook’s original storage benches and bookshelves, were must-keeps. So, what was on the chopping block? We ditched all the appliances — clogged disposal, broken dishwasher, rattling fridge, and a stove with what seemed to be a small gas leak — right away. The chipped tile countertops and backsplash had to go, too. 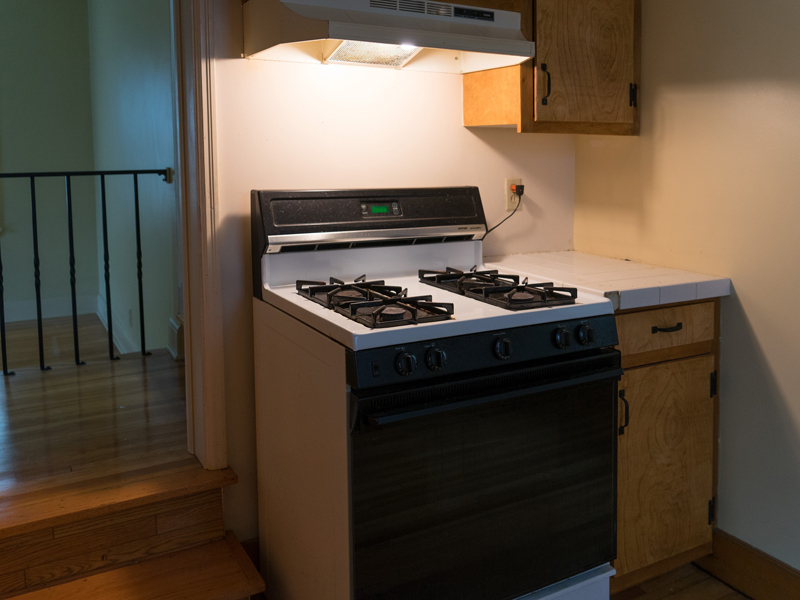 Finally, we removed the dinky cabinets around the stove that had been added in the ’80s. We had better ideas for that area. Before: An old, leaky stove ready to be replaced with brighter, better things. Roger got to work meticulously painting the cabinets and drawers. We used black to create contrast with the white walls, bead board, and quartz countertops. Open the drawers, however, and you’re greeted with a happy shade of robin’s-egg blue — a bright surprise and a practical choice that makes locating the proper utensil easier. After: With new appliances, freshly painted cabinets, and sparkling countertops. My dad (the true MVP of this project) and I pulled out the grease-splattered vent hood and upper cabinets above the stove. We had a hunch that the low soffit above these was hollow, so we cut into it for a peek. The home’s original plaster hood had been boxed in, so we opened it up and incorporated it into the design. Roger painted black-and-white stripes (a recurring theme for this home) on the inside of the hood, and I designed laser-cut scalloped trim to finish it off. After: Personalized touches like the special-order Italian stove completed the transformation. Kitchen appliances are a longtime grievance of mine. I wish manufacturers would give us a broader range of colors and sizes that are scaled appropriately for older homes. So, it is with some sadness that I — the guy who has been bored with stainless steel for a decade — ended up with a bunch of stainless steel appliances. But you try finding a French door refrigerator with a pullout freezer that fits into an opening 4 inches narrower and 3 inches shorter than the current standard. That’s right — there’s literally one such fridge on the market. Guess what? It’s stainless. We did manage to include one appliance that definitely stands out: our bright orange range. We special ordered it from Italy, and it took forever to arrive. It lacks modern conveniences like a preheat function, a baking timer, or even a clock. But it’s stunning and fun, and painted in the same factory that paints Ferraris, and hey, I never told you we were rational people anyway. The finished room incorporates everything Roger and I need in a modern kitchen — plenty of storage, LED under-cabinet lighting that makes the countertops glow, a functional ice maker, and even a garbage disposal that doesn’t smell like the La Brea Tar Pits. But at the same time, it retains all the character we love about the home — charming cabinetry, adorable breakfast nook, and hardwood floors. Do we occasionally long for features you’d find in new cabinetry, like a pullout spice rack or soft-close drawers? Sure. But we’ll take these squeaky old drawers and continue enjoying our one-of-a-kind new, old kitchen. Should You Buy a Rental Property if You Have Existing Debt?